Depending on the climate zone, attic insulation benefits can vary. 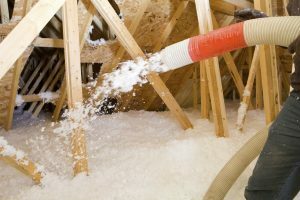 Essentially, attic insulation resists the transfer of heat between the living quarters of your home and the attic overhead. If your home was built before 1980, it may well be under-insulated by today’s efficiency standards. Upgrading to current U.S. Department Of Energy recommendations will reduce heating and cooling costs by up to 50 percent, depending on climate zone, particularly if installation is preceded by sealing air leaks. 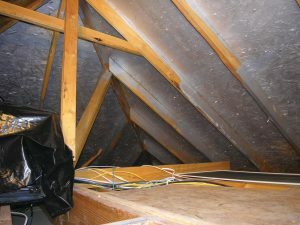 There are two main types of insulation used in attics. In a hot climate zone like southern Arizona, for example, we typically recommend blown-in fiberglass and radiant barrier. Blown-in fiberglass insulation provides a dense, effective barrier against heat loss that is also among the greenest insulation options. It provides affordable R-Value per inch and offers low environmental impact and immediate energy savings. Proper installation is a must for blown-in insulation. Special equipment and safety measures are required to ensure long-term performance. A radiant barrier, such as HeatBloc-Ultra, is applied to the underside of the attic roof deck to significantly reduce the amount of radiant heat entering the structure, thereby reducing cooling requirements and saving you money. Radiant barrier attic insulation benefits homeowners because it stops over 80% of the radiant heat that is trying to enter your attic from the roof. The service life of HVAC equipment like air conditioners and furnaces is extended due to reduced cooling and heating load. HeatBloc-Ultra is an aluminum colored, water- based, low emissivity coating. 80% of the heat gain in a home located in the southern part of the country, during the Summer, is from radiant heat. When applied to building materials such as plywood, plasterboard or OSB, HeatBloc-Ultra will have a dramatic effect on the performance of the home and will stop over 80% of the radiant heat that is trying to enter your attic from the roof. Upgrading attic insulation benefits homeowners by improving the comfort of the home and saving money on heating and cooling costs and extending the life of HVAC equipment. To learn more about installing attic insulation or the other services we provide, contact USI online to find a branch near you and get a free quote. USI believes in excellence in every step of the process and ensures timely completion and quality of service, time after time.